Growing up much more a brain than a jock in my hometown, my dad had an interesting theory on me and sports. A former high school football player and mid-distance sprinter himself, he decided he wanted me to play a sport, but not one where head injuries were par for the course. Given the recent scrutiny around football and concussions, dad might have been ahead of his time when he first put a racquet in my hand. I'm not sure if it was my first racquet, but it was certainly my favorite. 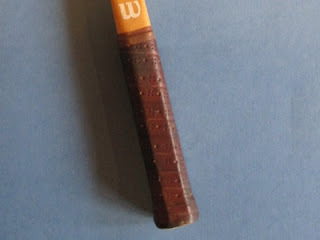 It was a Wilson, laminated wood with an orange stripe on the throat, it bore the signature of some player I was too young to recognize at the time, and whose celebrity is too faded for me to remember now. Secondhand, with a wooden racquet holder and black and white strings that I beat until they broke a year or two later. I should point out it was the late 80s at this point. There were metal frames on the market, but none that cost a dollar, so, it was decided, I would learn like the old masters. I hated the game too. Should I mention that? After trudging down the grassy hill to the secluded sunken courts in one of the local parks where I learned the game, my dad smacked balls over the net at me with little rhyme or reason. He didn't know how to play the game either, but he was athletic enough at the time to make a good enough show of it for his young son. His effort aside, I wanted only two things in those early moments: air conditioning and a TV. I spent more time retrieving balls from the patches of weeds growing underneath the curling, rusted fence than ripping forehands, but little did I know, it would be the start of a love affair with the sport. When I got back to the TV at some point, I really started watching the game, I'd vaguely remembered seeing Michael Chang win at Roland Garros amid some historical moment in his ancestral China that I was too young to really comprehend, but at the end of that summer I got to watching, really watching, the US Open. It was 1989, the courts were pea green then; Louis Armstrong was the main stadium, Times Square was a few years pre-Disney led renaissance and Andre Agassi played his way to the semifinals. By this point, I had gone from stomping around the courts in petulant, pre-tween shows of defiance to hitting the ball with grudging tolerance in the late summer heat. Watching on TV was different though, it was really what drew me in. 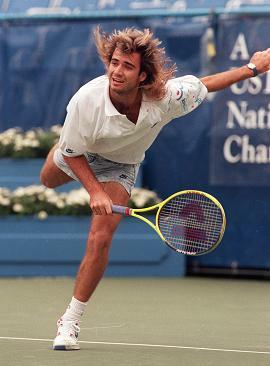 Somehow, I found myself watching a fair number of matches, but in particular, Andre Agassi. This guy was different from the others, he had rockstar long hair, wore neon in a sea of tennis whites and starred in commercials where he was driving a Ferrari. Hell, it was 1989, the man was the epitome of cool. He could also, as the world would find out, play this game. Agassi wasn't a major champion yet, but he was a fun player to watch, if for no other reason than to hear the commentators barely conceal their disdain for the brash attention magnet. Remember, this was the era of Ivan Lendl, Stefan Edberg, Mats Wilander, great champions all, but if tennis ever fielded an All-Snooze Team, I dare say, they would figure prominently. Agassi was a rebel on court and off. He had a game that was the prototype for today's dominant ground assault style and was electric down to the bright pink spandex he wore under his denim shorts. One of the best ball strikers in the modern game, Agassi was an expert at taking the ball early, robbing all but the absolute best servers of the time they needed to set up for their big, looping groundstrokes. His baseline bashing may have been the knockout blow that put serve and volley tennis in its decade plus coma. Anyone who knows me as a sports fans, knows I love the "almost" champions. I root for teams and athletes that generally break my heart on a regular basis and early Agassi certainly fit the bill. He was a top 5 ranked player as early as 1988, but it took him longer to make a grand slam final than his ranking would have suggested. When he did make the big show for the first time in Paris in 1990 he was the favorite, but he lost, dare I say, choked against an aging Andres Gomez. He then lost the 1990 US Open to his future archrival Pete Sampras (it was Sampras' first time getting beyond the fourth round of a major, by the way), before falling in the1991 French final to former Bollettieri bunkmate Jim Courier. It's almost as if I need to vicariously share in athlete or team's misery to really bond with them and just like my New York Knicks, Agassi gave me plenty of chances to feel sympathy pains. Fast forward to 1992, my own game had improved significantly. 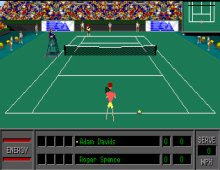 I had learned to keep score thanks to World Tour Tennis, one of the best early tennis video games ever made. I had finally graduated to a graphite stick, in all my pre-teen sophistication, I remember picking it because of the color. I'd gone from doing whatever I could to get back into the AC to pushing my dad to hit the court on hazy, hot and humid summer days. Suddenly, I was dreaming of winning the majors I saw on TV. Agassi fulfilled his dream that year, winning Wimbledon over a young Goran Ivanisevic. I too, won Wimbledon that year...in my head...on a macadam hardcourt...with salsa blaring from a parked car on the other side of the park...against my dad... in straight sets. Andre Agassi would be a constant during my tennis life. When he won the US Open in 1994, I was a year from starting high school where I would play my first competitive matches, realizing quickly that my best shot of getting to Centre Court, Chatrier, Louis Armstrong or Laver would be with a ticket, not a racquet. When Agassi won Roland Garros in 1999 he completed the Career Grand Slam. I, on the other hand, had just ended my high school tennis career, a lot less successful than I'd imagined, but convinced I was a better player than I had been able to show. I was also convinced that, yeah, Pete Sampras might have won 11 majors (at this point), but Agassi's won all four majors, on three different surfaces, plus the Olympic gold medal in Atlanta. He was the first man to win what has been dubbed the Career Golden Slam. To me that was (and is) a bigger feat than serving your way through Wimbledon over and over. Discuss. When I moved to New York, a friend who knew I loved tennis suggested we head out to US Open. I was new to the city and frankly, have no idea why I hadn't thought of attending already. The Open would become my annual staycation in ensuing years, but at the time, I don't think I even knew where Flushing Meadows was. When we got to the stadium though, I knew exactly where I was. Physically, I was in a section of Arthur Ashe stadium that was so high that it could've been serviced by Delta; mentally, I was right at home. Below me on the court was a speck that I had idolized since I picked up a racquet. I was told that speck was Andre Agassi and the jumbotron confirmed the call. I'd gone from watching a long-haired brash teen idol on a fuzzy over-the-air TV signal as a kid, to watching a balding elder statesman live as a wet-behind-the-ears professional in Arthur Ashe stadium. Over the next couple of years, I'd have the chance to see Agassi play a handful of times at the US Open. Those matches were always special in a way that seeing other players, no matter how much I enjoy their tennis, never was. Watching Agassi play always evoked my own tennis life, from the innocence of learning the game as he was ascending toward his ultimate peak, to confronting my own tennis mortality and that of my heroes. My most regrettable Agassi memory is from that epic 2005 late night quarterfinal showdown with James Blake. I'm watching the match with my boss and we've got great seats. Agassi fell behind two sets to love to Blake, 6-3, 6-3. It was late, my boss was commuting back to the nether regions of Connecticut and she told me she was leaving. I took a look at the scoreboard, took a look at Agassi and said that I was too. In that moment, I panicked. I was convinced I was not only about to watch my hero lose the match, but that the 35 year old would retire right then and there in that night session on Arthur Ashe. I just knew it and I couldn't bear to watch. Agassi's body had been breaking down all season, the end was nigh, but I wasn't about to watch it. Not that night, not in-person, not alone in that stadium. We all know how that narrative would end for Agassi, I wound up watching the fourth and fifth sets at home, screaming, fist pumping and texting like a madman with other friends who were watching. After everything Agassi had put me through while I sat in the stadium, he would, of course, come through to win that match, stave off Father Time and fight another day. He'd get all the way to the final before falling in a valiant effort against Roger Federer. There you have it kids, one of the most discussed matches in US Open history. I was there, I had great seats and I left. Agassi would struggle his way around the tour one more time, unfortunately, it was less a victory lap than a duct tape and cortisone-aided attempt to bid farewell to his favorite events and the fans along the way. He told the world at Wimbledon that he'd end his career at that year's US Open. The scene I avoided the prior year was going to be played out after all, within 30 minutes of my apartment. As luck would have it, although I had tickets, I wasn't there. When Andre Agassi played his last professional match, I was back home in Pennsylvania for a friend's wedding. I never saw the match live and ultimately, I'm happy it happened that way. I read the headlines, heard the speech later on SportsCenter, but reading the result over a cellphone is bloodless, witnessing it in person would've been a bloodletting. 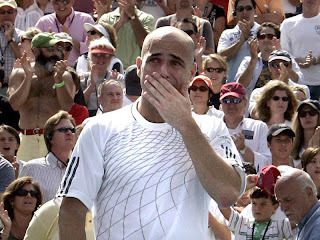 Today, Agassi will go into the International Tennis Hall of Fame. That's a sign you're getting old, when your childhood heroes aren't just getting older, or even retiring, but they're being enshrined into the Hall of Fame. The player who did so much from afar to bring me into the game is once and for all, truly out of it. Me? Of course, I'll be watching Agassi be enshrined, but more importantly, I'm hoping to get my backhand back in order. Always my stronger wing, it's suffered of late as I've worked to improve my forehand. I love my backhand, even though in all honesty, I'm more likely to approximate Steffi Graf's dipping slice than Agassi's two-handed drive. Yeah, maybe after that, I'll come back home and write more about tennis, since I'm still undeniably in love with the game. For that, well, I've only got a couple of things to say. Thanks Dad, thanks Andre. whether it is day or night, you can anytime go to the website of these companies and go shopping for your favorite item anytime. replica chanel The companies own safe and secured delivery services with which you product will be delivered safely to your doorsteps. louis vuitton replica Thus, the online store is designed very friendly and you do not need to get hassled, louis vuitton replica but you can easily find the product you are looking to go and easily check out after shopping. louis vuitton replica If you want to know more about the company and the services, you can visit the website and benefit from the services. fake louis vuitton For more information please visit online clothing and accessories. Women love accessorising. The chanel replica Bags a key section from the Autumn/Winter 08/09 accumulating - is aggressive by the mood, spirit and blush palette of British painter Chanel. Sumptuous, structured and beautifully crafted,the Chanel Replica Handbags was created in a ambit of lambskin leather, including pleated alligator,calfskin leather, suede with "CC" logos and textured covering lining. Containing adapted pockets for holding adaptable phones, MP3 players and PDAs, it follows Chanel attitude for action as able-bodied as form. The colors of the replica wallets accumulating echoes the aerial but affluent tones of the Autumn/Winter 08/09 ready-to-wear pieces, from aphotic amber to antagonism blooming and affluent Bordeaux.replica handbags Claws action allure for black and are heavily embellished, featuring lambskin leather with "CC" logo, alternation handle and attachment pocket.For Chanel Spring/Summer 09 the accouterment collection took afflatus from agronomical girls and romance, featuring a affable landscape-inspired color palette and channelled classics. For the http://www.thamesbooks.co.uk/thanks.phpBags this translated into easy-to-wear totes in calfskin covering with allegory covering straps or asperous belted alloyed straw. All- over covering and metallic versions in matt brownish and argent aswell featured, alongside affected clutches.